Enriched with vast industrial experience in the industry, we offer varied range of Cantilever Racks that are quality assured and have smooth finishing. Our entire product range is performance oriented and is durable in nature. They have high load bearing capacity and are used in industrial and commercial applications. - An efficient way to organize and store long & flat materials. - Available as either single or double sided units of variable heights. We manufacture, export and supply the best quality Cantilever Racks. The offered racks are used to place different kinds of products in arranged manner. 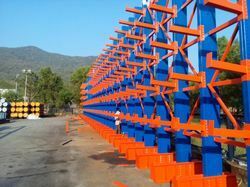 The provided racks are manufactured by utilizing topnotch quality raw materials with the help of advanced technique under the observation of our experienced professionals. We are a coveted manufacturer and supplier of optimum quality Cantilever Storage Racks. Pennar’s Cantilever Storage Rack is a type of warehouse storage system consisting of the vertical column, base, arms, horizontal and/or cross bracing. These components are fabricated from both roll formed and structural steel. The horizontal and/or cross bracing is used to connect two or more columns together. Conceived & designed to guarantee reliability & high performances over time.Functionality, safety & design are the major characteristics of this line.The compatibility with back to back combined installations, make it the best solution for the kitchens. NetRack offers a range of Cantilever & Fixed Shelf to meet the requirements of the user. The shelf are made of CRCA Sheet Punched, Formed & Powder Coated. 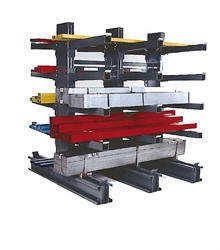 Cantilever Rack is the ideal solution to store long and awkward over size goods with direct accessibility. It is available in both single sided and double sided configurations.